I watched this fun Japanese film, One Cut of the Dead, the other evening. It’s ostensibly a comedy zombie movie, but in fact it is much more than that. Shot with a low budget of 3 million yen ($25,000 US), it went on to be a hit, finally grossing over 3 billion! Rightfully so in my mind. I’d say it’s a must-watch for anyone interested in filmmaking. Because more than a zombie movie, it’s a movie about the absurdities of making a movie. Its plot is heavily contrived, but turns out in the end to be heavily meta. It’s a film within a film, and if you include the behind the scenes shots in the end credits, it gets even more meta! It opens with a 35 minute long ‘film’ done in one crazy shot, that eventually gets taken apart in the second half. So many of the things that make no sense at first become gags and punchlines. it’s easy to forgive the contrivances that hold it together, and to overlook how transparently Ueda reverse-engineers most of his best gags. Seemingly unimportant details in the film’s sluggish middle section blossom into killer jokes some 30 minutes later. The movie is great fun for anyone in the mood for a light-hearted and clever comedy and a great lesson for anyone wanting to peek behind the scenes at indie filmmaking. A helicopter pilot showed off some mighty skills in the French Alps a week ago. He plonked the helicopter’s nose right up against the mountain, with the blades just inches from the snow, so rescuers could get to an injured skier. There is however, a far side of the moon, and the Chinese have now landed there. As I mentioned in the previous post, space exploration seems to be heating up. The latest news is China plopping a lander, named the Chang’e 4, on the far side (AKA the dark side) of the moon. They’re going to do some pretty far out experiments; growing potatoes in a box, which also currently contain silkworm eggs. The idea is that the eggs will hatch and their oxygen will feed the potatoes. They hope to discover the effects of low gravity on the growth of vegetables as well as they quality of the silk spun by the silkworms. They’re planning to start up a cottage industry in outer space potatoes and space silk blouses. …no, not really. They’re looking to see how viable it is to put a base on the moon from which to explore further reaches of space. They also note, that it is a good place from which to explore space as there is no electrical interference from the Earth on the side of the moon facing away from us. They released the first image today. There’s so much fun space exploration going on right now. With the Mars Insight Lander and the Japanese landing on an asteroid, among many other exciting new projects. Now the Americans are about to try to replicated the success of the Japanese. Yesterday, after a two year journey, a spacecraft transporting the robotic explorer dubbedÂ Osiris-Rex arrived at another asteroid, this one named Bennu. It’s currently orbiting the asteroid at a mere 19km and will get closer as the days go on. 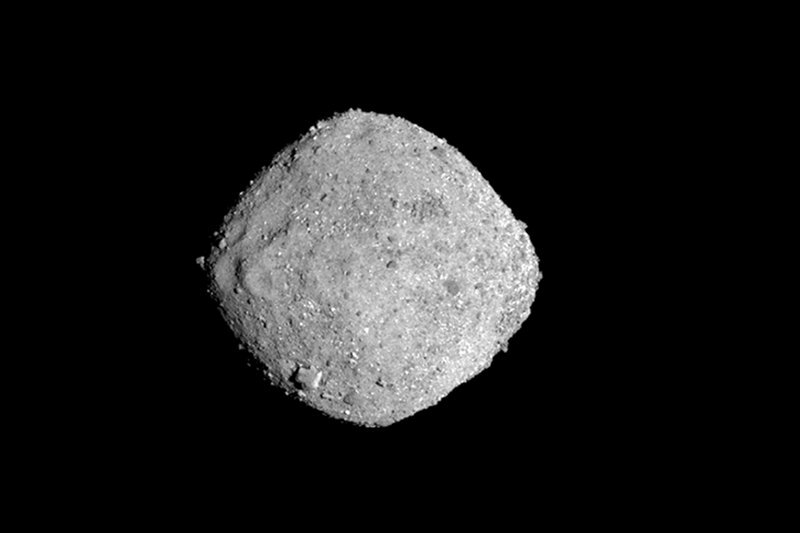 Bennu is thought to be about 500 meters across and is about 122 million km away from Earth. The spacecraft will orbit it for a year before scooping just over 60 grams of material and sending back to earth. Its booty is expected back around 2023. The purpose of the mission is to better understand the birth of the solar system, as the asteroid is thought to date back 4.5 billion years, around the time the solar system came into existence. Bennu is also thought to be something of a risk for us, as it’s getting closer and closer to Earth with every pass. They predict it could hit the Earth in about 150 years and cause significant damage. From this mission, they also hope to be better able to understand how to avert that potential calamity. Family of killed man forgives Tribe. Does tribe forgive man? I have no sympathy for this man, who was killed while attempting to illegally contact one of the remotest tribes in the world and convert them to Christianity. John Allen Chau from Alabama, clearly knew what he was doing was wrong. He had someone sneak him onto an Andaman island in India where the Sentinelese tribe live. There are estimated to be 50 to 150 members of the tribe and contact is forbidden to protect them from outside diseases. You can even be charged for simply taking photos of them. He set up a covert operation to get himself onto the island, and came back to the boat once with arrows having been shot at him. He said one of the boys in the tribe fired an arrow which pierced his waterproof Bible. He then tried again a couple of days later, and then a third time. That time he did not return. He was seen on the beach shot by arrows, and finally being dragged around by a rope around his neck. And that was that. The tribesmen did not become Christian. Now at great expense and effort the authorities are trying to get his body back. Seven fisherman who helped get him onto the island have been arrested. From the reports, it sounds like the authorities are not exactly sympathetic either. Why would they be? He wasn’t doing “God’s work”, but the work of a Western Imperialist’s ego. We certainly have been through all this on a grander scale before. We forgive those responsible for his death. How very generous. I’m not sure what he was doing is forgivable; trying to foist his self-righteous ideals on a group of vulnerable people who he was told to stay away from, and who gave him ample opportunity to back down. Indeed, he has only himself to blame. But he’s dead. I have been pretty enraged on my bicycle by cars cutting me off, or even bumping into me, but I rarely fly off the handle. I have however seen some people go pretty ballistic with rage. This one takes the cake. And I’m not even sure how this is physically possible, let alone how one would conceive of such an action. A cyclist in Victoria, BC collided with an automobile (or vice versa) and his response, along with hurling expletives, was to pull down his pants take a dump and hurl his turds. How does one even do that? Shitting on cue. I am amazed by the whole thing. The police are on the lookout for the crappy fellow. This incident is reminiscent of another recent turd hurler. The woman who pooped on the floor of a Tim Horton’s when she was refused use of the toilet and threw it at staff. At least in this case, we know she really had to go. Maybe she kicked off a trend? Read more about the poop rage: Cyclist defecates, throws own poop at woman after vehicle collision in B.C. The Guardian is reporting that the world’s oldest shipwreck ever has been found in the Black Sea. An ancient Greek ship with it’s mast, rudders, and benches all still in place has been found at 2400 meters deep. It has been preserved due to the lack of oxygen at that depth. This is the first time a ship like this has ever been actually seen, other than as depictions on Greek pottery. This is a pretty fantastic find! I love ancient artefacts that connect us to our history like this. And it is truly amazing they we can still unearth things like this. There’s something on your shoe Mr. Trump. File this one under ‘shadenfreude’. Donald Trump seems to have gotten a wee bit of toilet paper stuck to his shoe! Oops! Here is yet another sad tale, from the Guardian, about the destruction of nature by humans. On the 11th and 12th of October, London will be hosting a summit to discuss the illegal destruction of nature and various wildlife species. It’s a problem that officials are saying isn’t being taken seriously enough. With what’s being called the 6th great mass extinction being blamed on human activities, something has got to change quickly. The article reports that, “Over 80% of all mammals and half of plants are thought to have been lost since the rise of human civilisation.” That is a pretty depressing statistic. I often think about what we have been robbed of by the generations that came before us and am astounded by their short-sightedness and greed. Nothing has changed! Imagine what North America must have looked like to the European settlers; a bounty of wildlife – more fish, trees, buffalo, etc. than they had ever seen. And what did they then proceed to do? Destroy it all. …in record time. It is hard to fathom how anyone could think this was acceptable. …but we haven’t stopped.